It was mid-December and I had traveled to the coldest, driest, and windiest continent where there”s no permanent human residents or any evidence of any pre-historic indigenous population. It lies in darkness at the bottom of the world. It”s a vast unknown, like an afterthought of creation. Antarctica would prove to be the type of adventure that makes life worth living. At 63 years of age I wanted a “different” kind of experience. I got it. It”s about a ten to fifteen hour flight depending on where you leave from North America to Buenos Aires, Argentina. After overnighting Argentina”s capital city it was another three hour flight to Tierra del Fuego and its capital Ushuaia where I embarked on a ten day trip aboard the mv Discovery to the South Shetland Islands and Antarctica Peninsula. People who knew the television series, “Love Boat” will recognize the mv Discovery. It was built during a time when vessels had graceful lines and not manufactured in mass quantities. After a superb refit in 2003 it has back its original charm. 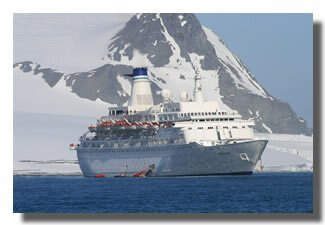 It”s a classic ocean liner with a passenger capacity of 800, but never carries more than 650 (500 for Antarctica). On this cruise there were 425 passengers and almost an equal crew. When we were welcomed aboard, we were all given a red winter jacket. From that moment we all became a sea of red on and off the ship. I knew I was not going hungry. The exquisite welcome aboard buffet set the tone for the cuisine on the cruise. There are several places to eat aboard ship. The Seven Continents Restaurant has menu service for breakfast, lunch and dinner or the top-side Lido Café and Yacht Club Restaurant are two other alternatives. Amazingly, I managed to remain the same weight coming on board that I did when I disembarked. On warm days (remember, it”s summer in the Antarctic in December) I swam in the top side pool then soaked in one of the aft side hot tubs. 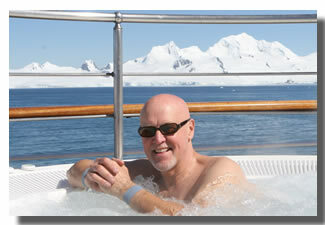 There”s something surreal about relaxing in a hot tub in the middle of the Southern Ocean at the end of the world. During the day I attended excellent lectures, arriving at the ship”s Carousel Lounge early for a seat to learn more about topics like, “A Beginners Guide to Penguin Appreciation” or the “Geography and Geology of Antarctica.” This was one of the highlights of the journey. If you get bored watching icebergs (if that”s possible) you can catch a movie in the Discovery Theatre. In the nearby lounge you can listen to a band and dance. Getting to the Antarctica is no mean feat. This is the body of water between the southern tip of South America at Cape Horn and Antarctica. It”s called the Southern Ocean and is the ocean that circumvents the Antarctic. It”s the fourth largest ocean in the world (after the Pacific, Atlantic and Indian Ocean, but larger than the Arctic Ocean). This passage held up to its reputation as the roughest stretch in the world. I was mesmerized from the first moment I set eyes on the continent. It was a place that expanded my senses of time. It was deliciously peaceful. I listened to the silence outside my porthole. The skies were flawless blue with marshmallow clouds. The sun was shining for 22 hours a day and the temperature about +3C (+39 F). It was truly another world. When weather permitted, as it did for most of this cruise, I took shore excursions (zodiac cruising) among icebergs to the continent itself. And it was Saturday, December 22 at 1 pm that I first stepped foot on Half Moon Island part of the 7th continent of the world, Antarctica. I became one of the approximate 35,000 people to do so each year. There was a sizable rookery of Chinstrap and Adelie penguins and an abundant bird population of terns, petrels, comorants, wandering albatross and whales. I saw stunning views of surrounding volcanic mountains. Later, we cruised just off ice-covered Elephant Island , named for its sizeable colony of elephant seals. Next day we visited King George Island home to the Arctowski Polish Research Antarctic Station. Managed by the Polish Academy of Science it is manned year-round and undertakes researches in biology, glaciology and oceanography. Would I Return? In a heartbeat. The vastness of this white continent made me feel like I was the only person on earth. I now have a persuasive calm and sense of balance. Much like the white continent itself. This Voyager Travel Article content is copyrighted by Travel Research Online, LLC.